Stadthuys is a recorded milestone that you couldn't miss while you are here in Melaka, Malaysia. 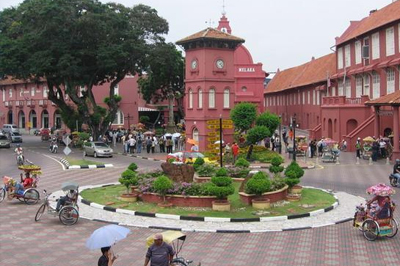 It is an awesome place to visit in Melaka Historical Fun list. Initially, Stadthuys Melaka was worked to serve as the official home for the Dutch Governors in 1650 after they crushed the Portuguese in 1641. This building anticipated a fine case of Dutch workmanship and woodwork aptitudes. This charming earthenware (earthy red) building was a four story building based on a patio of St. Paul's Hill covering 49200 Sq. ft in zone. The name itself is in Old Dutch spelling which truly signify "town corridor". Here in Melaka it is otherwise called Red Square. Simply observe the photo beneath and you will comprehend why it is named Red Square. Stadthuys Melaka is a propagation of the previous Stadhuis (town corridor) of the Frisian town of Hoorn in the Netherlands which existed from 1420 until 1796. Later, in 1976 the Hoorn's previous Stadhuis was supplanted by a building that is presently known as Het Oude Stadhuis (the old town corridor). The Het Oude Stadhuis is still found there and was being used until 1977. Subsequently, on the off chance that you are intrigued to know how the previous Stadhuis of Hoorn looked like in the fifteenth to eighteenth hundreds of years, you ought to make a beeline for Melaka as it gives a magnificent representation of the now terminated Frisian building. Initially, the Stadhuys like the other Dutch authoritative structures in South East Asia was painted white. Be that as it may, after Melaka was given over to the British, it was re-painted earthenware by the British in 1911. No one knows the genuine motivation behind why these structures were painted earthenware in shading. In any case, there are a lot of hypotheses and legends told by local people. One story specified it was the Dutch who painted the structures red as recognition of their country. Obviously, they needed to duplicate the shade of red block stone houses in Holland. Be that as it may, this hypothesis is sketchy on the grounds that as indicated by verifiable records, it was the British who painted the structures earthenware. There is an interesting story that, amid the Dutch Colonial, local people were venting their scorn and disdain for the Dutch by always spitting the red release from biting betel or "sireh" onto the white dividers of the structures. With a specific end goal to cover these RED spits, the British just painted the building earthenware! This is an innovative and interesting story as it consolidated the neighborhood social customs with against imperialism assumption. A more legitimate reason was that the red laterite stone used to assemble the Stadthuys appeared through the whitewashed putting because of the absence of support. Additionally maybe red soil regularly sprinkled up the white dividers after overwhelming downpours add to the British' choices to paint everything to earthenware to spare upkeep cost!